Booth Bay Harbor, ME - what a crowd! We don't come to Maine all that often, but as Brian said in his closing remarks - seems like we should! The Booth Bay Harbor Opera House was sold out to the rafters. 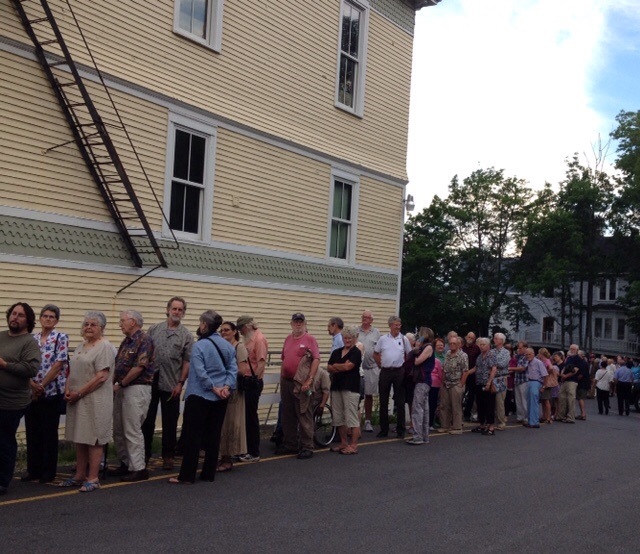 The audience had come from many places in Maine and was wrapped around the building early waiting to get in. Rarely - outside of Portland, Oregon- do we get so much hollering and appreciation after every number! Lots of fun. It's been very hot on this tour (101 in Rockport last night), but a nice Maine breeze came up tonight to cool us all off. Hope we can come back!